131 Commercial Real Estate and Properties in Sunshine Coast are listed in 8 categories. We have 131 Industrial Warehouses for Sale , 74 Retail Shops for Sale , 56 Offices for Sale , 53 Development Lands for Sale , 23 Hotels and Leisure for Sale and 5 Other Commercial Properties for Sale . 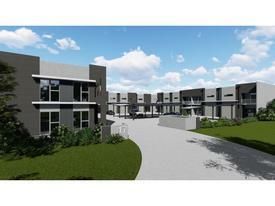 Approved Caretakers Residence With Adjoining Warehouse $495,000 + GST (if applic.. Situated at the very front of this development, the subject warehouse provides both front and rear roller door access with a loop driveway designed to negate the need to turn around on site. As the only warehouse in the development with two way access, this warehouse provides functionality not often seen in a premises of this size. Dual roller doors (front and back) Loop driveway for ease of access Mezzanine (approx 15 sqm) Front of development Ideal for small business / storage of goods Contact our exclusive marketing agent Jordan Hayes 0417 999 331 to arrange your inspection today! This freestanding warehouse is located in the centre of town, on the same road as quality operators such as BP Mitre 10. Opportunities to secure warehousing space of this size don't come often at this price. Overlooking Nambour, the premises offers a range of features including: Large clear span warehouse Enclosed skillion Quality office fit out with air conditioning, kitchenette, alarm, 4 individual offices + open plan room Mezzanine storage Ample hardstand For more information or to arrange an inspection, please contact Jordan Hayes on 0417 999 331 or Michael Shadforth on 0488 981 076. This freestanding warehouse is situated on the corner of Machinery Road Harvest Road with a flexible floor plan which is designed to suit either a single user or split into two tenancies. Positioned on a 2,075 sqm block, the building is set to the rear allowing for two way access and ample car parking. Warehouse 875 sqm Mezzanine 108 sqm Dual access 2 x roller doors (4.3m x 4.35m) Extraction fan For further information please contact Jordan Hayes on 0417 999 331 or Michael Shadforth on 0488 981 076. Areas approximate only. Investment Property $420,000 + GST (if applic..
2,280m² highbay industrial shed constructed on a 4,000m² allotment. Easy access to both north and south bound directions of the Bruce Highway Two Gantry Cranes Dual Access Will suit a multitude of business uses or division to smaller tenancies. The Property is offered vacant possession, on an as is, where is' basis. The Property is a freehold, and is improved with industrial warehouse, air conditioned offices, and excellent car parking facilities. The Property is located in an established industrial estate on the northern side of Yandina and enjoys access to the north and south lanes of the Bruce Highway. Great opportunity to secure an office warehouse for your business or a secure storage facility for your toys ideally located in the Noosaville industrial hub. Don't delay, properties of this size and value sell very fast. + Warehouse of 185sq m (approx) + Bonus mezzanine of 90sq m (approx) + Ample on site and street parking + Excellent access with high roller door + High bay lighting and 3 phase power Call or email Matt Marenko or Louisa Blennerhassett to inspect the property or find out about other suitable options. Our team is strategically located in two offices across the Sunshine Coast region and is ready to handle your commercial, industrial and retail property needs today so call or email now. 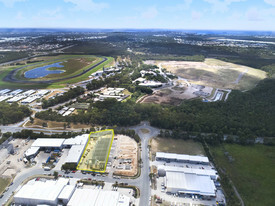 The Stellar development is perfectly positioned at the entry to Sunshine Coast Industrial Park affording both exposure and straight forward access out of the park and onto the Bruce Highway. 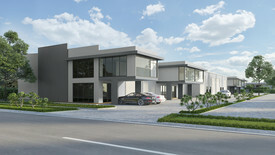 With 9 warehouses ranging from 170sqm 798sqm the development provides an option to suit every business. These warehouses have been carefully designed to maximise functionality and provide a level of quality well above that typically seen in the region. Whether you are looking for a new business premises, or a new investment, quality buildings stand the test of time and this development leads the market. #8203; bull; Units from 170.34m2 798.14m2 bull; 9 Units bull; Roller door access bull; 35 Car spaces bull; Pedestrian access bull; Adequate signage bull; Quality finishes and screening bull; Landscaped common area bull; Walls tilt slab bull; Metal roof bull; Expected completed Mid 2019 For more information, please contact the listing agents Jordan Hayes on 0417 999 331 or Michael Shadforth on 0488 981 076. Warehouse With Fit Out $420,000 + GST (if applic.. Compact, Clean Tidy Industrial Warehouse In Warana | For Sale $240,000 + GST (if applic..
Emily Pendleton from Ray White Commercial Northern Corridor Group is pleased to present to market this excellent little warehouse for sale, only one street behind Nicklin Way and in close proximity to the new Sunshine Coast Health precinct and Stockland Birtinya shopping centre. 103m2 Front unit in small complex Offers excellent exposure to the street Three exclusive car parks + ample street car parking Two roller doors 3m x 3.6m Three phase power available to site Located central to Sunshine Motorway, Nicklin Way Kawana Way For further information or to arrange an inspection please contact the appointed marketing agent, Emily Pendleton on 0402 435 446. Emily Pendleton of Ray White Commercial Northern Corridor Group is pleased to present 41 Pioneer Road, Yandina as a tenanted investment for sale by Private Treaty. The property is a well presented, easy accessible, freestanding warehouse home to two well established tenants for the Yandina and Sunshine Coast precinct being Make Safe Plumbing Pioneer Coffee Roastery. These tenants have made Yandina home for there business for a number of years and the rental information follows. The property is located just off the Bruce Highway in a prime position a few doors up from the well known, iconic Ginger Factory. Tenant: Make Safe Plumbing Operational: 3 years in this location Lease Commencement: 26 June 2016 Lease Expiry: 25 June 2020 Option: 1 x 2 years Rental Income: $54,424.80 Tenant: Pioneer Coffee Operational: 8 years in this location Lease Commencement: 1 May 2011 Lease Expiry: 30 April 2020 Option: 2 x 3 years Rental Income: $44,772.72 This property is being sold by the way of Private Treaty for $1,200,000. For further information or to arrange an inspection please contact Marketing Agent Emily Pendleton on 0402 435 446. Emily Pendleton of Ray White Commercial Northern Corridor Group is pleased to present 12 Daniel Street, Caloundra as a tenanted investment For Sale via Private Treaty. Nestled just off the easily accessible Caloundra Road in close proximity to the Bruce Highway, Sunshine Motorway, Nicklin Way Caloundra CBD. 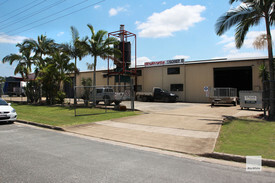 The property is situated within a high profile, stand alone complex in the heart of the Caloundra West industrial estate. 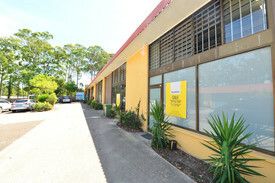 The property was not on the market for long and has just secured two brand new tenants, both on 3 year leases with strong business presence in Caloundra, both relocating from other premises within the estate. Tenancies 1 2 are tenanted to Prodigy Fitness tenancy 3 is tenanted to Mobbs Electrical. The total net income for both leases combined is $66,000 P/A Net and the tenants pay 100% of the outgoings in addition to there rental. This property is being sold by the way of Private Treaty with Offers Over $1,030,000. For further information or to arrange an inspection please contact Exclusive Marketing Agent Emily Pendleton on 0402 435 446. Office Or Clean Production Facility $390,000 + GST (if applic..
Rare opportunity to secure a clean production facility or office of 172sq m (approx) in a modern industrial development in the Kawana business precinct just off Kawana Way and within close proximity to Sunshine Motorway and Nicklin Way. + Split over two levels with suspended ceilings throughout + Air conditioned and recessed fluoro lighting + Fitted with reception, multiple offices and open plan areas + On site parking + Great signage + Adjoining warehouse of 424sq m (approx) also available + Also available for lease Call or email Matt Marenko or Tallon Pamenter to inspect the property or find out about other suitable options. Our team is strategically located in two offices across the Sunshine Coast region and is ready to handle your commercial, industrial and retail property needs today so call or email now. High Clearance Factory Warehouse With Power $850,000 + GST (if applic.. Solid industrial property of 424sq m (approx) in well presented development in the heart of the Kawana industrial precinct just off Kawana Way and within close proximity to Sunshine Motorway and Nicklin Way. + High clearance warehouse + Ample 3 phase power outlets + Front and rear roller doors for air flow + Hi bay lighting + On site parking + Also available for lease at $53,000 Call or email Matt Marenko or Tallon Pamenter to inspect the property or find out about other suitable options. Our team is strategically located in two offices across the Sunshine Coast region and is ready to handle your commercial, industrial and retail property needs today so call or email now. Powerful Warehouse With Office / Clean Production Area $1,090,000 + GST (if appl..
Versatile warehouse with large office or clean area of 596sq m (approx) in well presented development in the heart of the Kawana industrial precinct just off Kawana Way and within close proximity to Sunshine Motorway and Nicklin Way. + High clearance warehouse + Ample 3 phase power outlets + Front roller door plus rear roller door for air flow + Office split over two levels with suspended ceilings throughout + Air conditioned and recessed fluoro lighting + Fitted with reception, multiple offices and open plan areas + Hi bay lighting + On site parking + Also available for lease at $65,560 per annum + outgoings + GST Call or email Matthew Marenko or Tallon Pamenter to inspect the property or find out about other suitable options. Our team is strategically located in two offices across the Sunshine Coast region and is ready to handle your commercial, industrial and retail property needs today so call or email now. Under Construction - Affordable Industrial Units Prices Starting from $190.. Brand New Industrial Units Construction Commenced FROM $190,000 + GS..
High Span Tilt Panel Warehouse And Office Combination $1,090,000 + GST ..